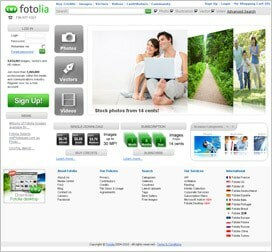 Fotolia features one of the largest stock image galleries in the world. Having more than 19.2 millions of royalty free images for sale, it takes the second place among other microstocks. It offers its customers two buying options: single purchase or subscription purchase. Single purchase of images is based on credits (see “What are the credits and what are they for?”). One credit price varies from $1.20 down to $0.75 depending on the credit package size. The minimum account refill required to make single purchases amounts to $12, which are transferred to your balance as 10 credits. You are free to spend those on any purchases within one year. For instance, you will be able to either buy 10 small images (for example, for blog posts) or one large image (7 credits) and one medium image (3 credits) as the scale of rates allows you choosing between various options. Vector images sold at Fotolia also have bitmap versions which are priced at 1 credit and up. Vector files of vector images are priced from 4 credits. When browsing through Fotolia gallery, you will probably notice that minimum prices vary from photo to photo: while the vast majority of images can be purchased for 1 credit, there are some items that are priced at 2-5 credits for smallest version. The prices on these royalty free images are higher because they were created by the most popular authors. You will get an opportunity to download a certain amount of large images at low prices on a daily basis, once you purchase a subscription with Fotolia. The cheapest subscription plan which includes 750 photos each priced at $0.27 is sold for $199. Having subscribed to this plan, you will be able to download large versions of all images presented at Fotolia, except for vector files of vector images, which require a separate subscription (750 images, each priced at $0.33, for $249/month). The more you pay for your subscription plan, the cheaper the items on Fotolia will be. For example, if you choose an annual subscription plan that costs a little more than $10.000, you will only have to pay $0.14 per image. You may say “but it's ten thousand dollars!” and you will be right. One of the biggest advantages of this stock photo agency is the very low prices of royalty free pictures using extended license which start from $8 (see “What is license on image using?”). Therefore, if you are primarily interested in this type of licenses, you should consider using Fotolia services as you will hardly find any cheaper options. It should be noted, however, that not all files available at an extended license are cheap on Fotolia: as the service gives its best authors an opportunity to set prices manually, sometimes it can be much higher than on other microstocks. To register on Fotolia click this link. Maximal times to print the content, or an element of the content: unlimited. Use the content in any derivative goods intended for resale: yes with restrictions. Use the content in any derivative goods intended for resale: yes. +: multiple ways of balance refilling. A good choice both for those who wants to buy one or two images and for those who needs monthly subscription for several hundreds files. This microstock possesses a huge variety of images, low prices and almost restriction-free licenses. Especially interesting opportunity for those who search files to be purchased by extended license. Nowhere you will find it cheaper and with lower restrictions.